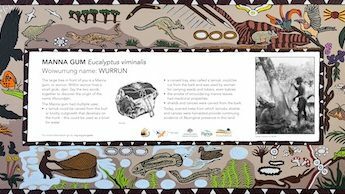 The leaves, inner bark, and root fibres of many shrubs, trees and reeds were used by the Wurundjeri to make mats, bags, hunting nets, baskets for carrying and cooking and articles of adornment such as necklaces, headbands and girdles. Human hair and animal fur were twined into string, and feathers, kangaroo teeth, echidna spines and ochres were added for decoration. Women used the partly dried leaves of the Mat-rush, and a small sharpened stick or a bone awl for opening up the weave, to fashion these strong baskets. A string handle made it possible to sling the basket over the shoulder or back for carrying foods such as yam daisy roots (murnong) or the bulbs of lilies and orchids. 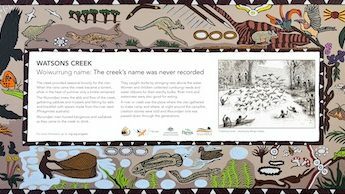 THE MAKING OF BASKETS AND BAGS: The leaves, inner bark and root fibres of many shrubs and tress and reeds were used by the Wurundjeri to make carrying and cooking baskets, mats, bags, hunting nets and articles of adornment. The Wurundjeri made many of their baskets from Lomandra. Leaves were split lengthwise into two and dried. Before being worked they were soaked for 24 hours in water. A bundle of the long leaves was covered with a buttonhole-stitched strand which joined the coiled rows together to form a hardy, long-lasting carrying utensil. Some baskets were strengthened and patterned by passing the looping fibre over two rows of coils. A sharpened stick or bone awl was used to open holes in the weaving. A string handle made it possible to sling the basket over the shoulder or back. 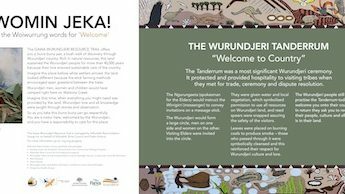 Baskets woven from Lomandra can be seen at the Koorie Heritage Trust, Melbourne and at Bunjilaka at the Melbourne Museum. Baskets could be made large enough to carry a child, tight enough to carry water, or strong enough for collecting bush foods such as the tubers of yam daisies, orchids and lilies, berries, rhizomes, water ribbons, grubs, small lizards. Soaked in water and placed on hot stones, baskets were also used for steaming plants and fruits. They could be sealed and made waterproof with wattle gum and ash mixed to a paste. When yam daisies were cooked in this way they break down to a thick soup called ‘minni’. The leaves, bark, or root fibres of many grasses, shrubs, trees and reeds were also used to make baskets as well as string for bags, nets and articles of adornment like headbands and girdles. Human air and animal fur were also used.